In a bid to bring the A series' new-found premium design language to the masses, Samsung's E-lineup has managed to maintain the same looks. Lower-grade hardware and entirely plastic build have helped keep the price down, but if you don't look too hard it's still an upmarket smartphone. The design aesthetic of the E7 is unmistakably Samsung - a mix of the Galaxy A7 and the Galaxy S flagships before the Galaxy S6 came along. The metal frame of the A7 has been replaced by plastic, emulating the looks, but not exactly the feel. 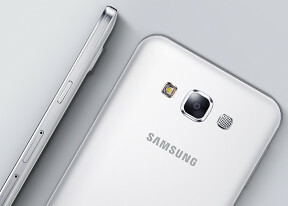 On the other hand, the rounded corners are more of a throwback to the S5 than the sharper A7 styling. A downgrade in the specs was also to be expected and the Galaxy E7 is powered by the lower-midrange Snapdragon 410 as opposed to the snappier Snapdragon 615 inside the A7. The 2GB of RAM is intact though, so not all corners have been cut. 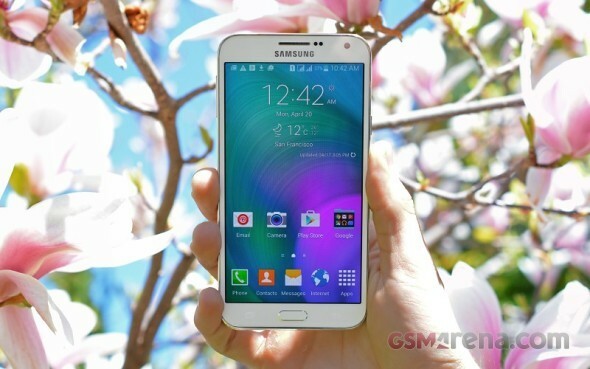 Samsung's Super AMOLED display is also on the keep list, albeit in a more affordable 720p resolution. And if you thought that the E7 will skimp on battery capacity you're wrong, as it comes with a 2,950mAh battery, actually an upgrade over the more expensive Galaxy A7. The OS update is a shortcoming that's fixable and, with Lollipop reportedly on the way, we'll not hold it against the E7. The screen resolution isn't that big of an issue either and offers decent pixel density for the price segment. The non-removable battery may not be a deal-breaker, but the versatility and future proofing of a user-replaceable battery is an undeniable advantage. Update Aug 31: At the time of writing neither Samsung nor Corning had readily available information whether the Galaxy E7 had Gorilla Glass protection. As it turns out, the smartphone comes with the latest iteration Gorilla Glass 4. Original text follows. What's difficult to come to terms with is Samsung's decision to omit the Gorilla Glass protection, and aftermarket measures should be taken to protect your device, which is hardly the best option. Join us on the next page where we kick off the usual routine with unboxing and a hardware overview.